Citroen’s quick-and-easy entry to the SUV market made for a surprisingly rugged and practical family 4x4. Filed under the heading of ‘you don’t see one of those every day’, the Citroen C-Crosser is probably one of the rarest cars on our roads. First on sale back in 2007, it was part of a three-way-tie up between Mitsubishi, Citroen and Peugeot to share engines, chassis and engineering expertise across a range of models. The three brands also collaborated on dinky electric city cars (the Ion, the C-Zero and the iMiEV). That makes the C-Crosser less of a true Citroen perhaps, but it’s certainly a decent used buy and worth seeking out. The C-Crosser is, in its most basic form, a second generation Mitsubishi Outlander with a Citroen badge, grille and lights glued to the front (the Peugeot version was called the 4007). It’s not perhaps the most elegant solution to creating Citroen’s first 4x4 since the Mehari (or the original twin-engined 2CV Sahara), but while you can instantly spot the unchanged centre structure and rear end of the Mitsubishi, the Citroen front end is actually relatively graceful and handsome. Plus, it has one major advantage over the contemporary Mitsubishi Outlander, which is that it used Citroen’s own 2.2-litre 160hp diesel engine – a superior unit to Mitsubishi’s 2.0-litre powerplant at the time, both more powerful and more economical and certainly more refined. You could have bought a 2.4-litre petrol engined version too, using Mitsubishi’s own engine, but that was never officially sold in Ireland. 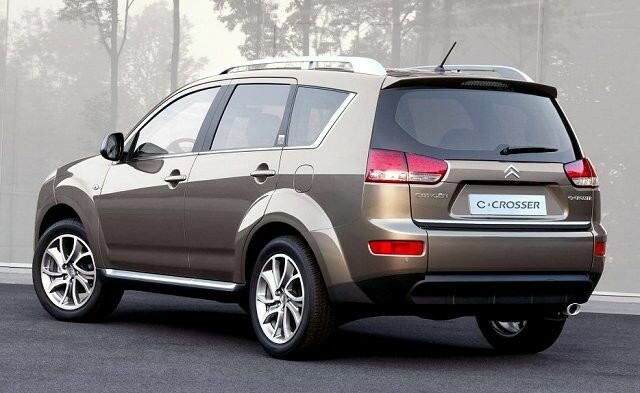 As with the Outlander, the C-Crosser is most commonly found with seven seats, making it a very useful family wagon. The third row seats aren’t the biggest (are they ever?) but they’ll do for kids for short hops and that’s what makes them useful. The rest of the cabin is all Mitsubishi’s work, aside from the Citroen badges, which means it’s plain and a bit cheap-looking, but serviceable and rugged. Serviceable and rugged pretty much describes the rest of the C-Crosser. Reliability, as you’d expect of a car built by Mitsubishi, is pretty excellent, although you have to watch for leaky fuel pipes, faulty brake lights and brake sensors and premature wear to the clutch and gearbox. Check carefully underneath for off-roading damage too – the C-Crosser was surprisingly good at getting in and out of muddy places, and many former owners may have gotten a bit carried away with that capability and done some damage underneath. Finding one will be the hard part – with only 18 months on sale before the financial crash stalled the car market, few were sold, but they can be found and represent good value. Less than €8,000 should get you a 2008 or 2009 model, which will have plenty of life left in it. It may take a bit of legwork to track down, but the C-Crosser is a solid, useful family SUV that can these days be found at a very affordable price.